Labels: Useful Heuristics or Dangerous Stereotypes? They say love blinds and power corrupts. Well, I’m starting to think morality is pretty good at both. When I was depressed in early 2013, I began attending weekly CBT (Cognitive Behavioural Therapy) sessions in the hope that it would make me better. During one of these sessions, the therapist (counsellor? psychiatrist? I never quite know the difference…) declared that one of the things condemning me to the deep, dark pit of depression was my tendency to see the world in black and white. And I agreed. I did see the world in black and white. You’re either a good student, or you’re not. You’re either an organised person, or you’re not. You’re either an outgoing person, or you’re not. I guess we all do it to different degrees. But my degree was what you’d call excessive. My world was a dichotomy. There is a black box (black bad), and a white box (white good). And I categorised people, situations, things, and most of all myself according to these two boxes. If I was having what you would call a lazy day (i.e. lounging around the flat watching series and not doing homework/revision/productive things), I’d see it as a confirmation – an indictment, even – that I was a useless, good-for-nothing, lazy person. Rather than just see it as a lazy day and enjoy it for what it was. By the end of four years of university, you can imagine how bad I had become in my own eyes. I had always been my harshest critic, but university life – unstructured and potentially isolating as it was – allowed my self-criticism to reach a whole new level. I was always doing assignments last-minute (though I did always complete and hand them in). I was spending whole days studying while others would go to the library, study (efficiently) for four hours, then go out and have fun. I was not going out as much as other people appeared to be (on Facebook). Consequently, I was a bad student. I was a useless person no one wanted as a friend. I was nothing. So on and so forth. I was constantly labelling myself. I did not see things in terms of degree. Every little action, thought, feeling was instantly taken as a confirmation of a label. And most, if not all, of the labels I was putting on myself were what I consider ‘bad’ things. No wonder I got depressed. Now, I think labels are a good thing. They’re heuristic devices that help you make sense of a nonsensical world. Because that’s what the world is: a mumbo jumbo of events that by themselves do not make sense. A label helps us break the world down into information bits simple enough for our puny human brain (compared to, say, super computers) to process and understand. Let’s have some examples. She is a doctor – this means I can go see her when I am ill. He is a teacher – that is why he is reprimanding my child at school. This is a school – where the people will be responsible for the safety of my children during school hours, so it is ok for me to leave them there for the day and not worry about them all day. I am a writer – so it is fine for me to spend hours blogging when I should be revising, because I am being forward-looking and practising my writing skills for my post-university writing career. And so on. 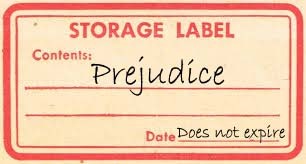 When do labels go from useful heuristics to dangerous stereotypes? What I was doing at university certainly falls in the latter category, though the above labelling examples are – I’m sure you’d agree – useful and quite necessary in life. I’m inclined to say the switch-over happens when morality enters the equation. That certainly applies in my case. Remember the black box bad, white box good? Being lazy and quiet in social situations is bad. Being efficient and outgoing is good. There is no such thing as a lazy day for an efficient person. You have a lazy day? You’re not an efficient student and therefore a bad one. I don’t know if you suffer the same tendency above as I did. Or if anyone does (though I suspect some must do – if only out of statistical probability). So I can only speak for myself. For me, it was tiring. And not at all desirable for my psychological well-being. Do I still do it? From time to time, though now that I am conscious of these malicious thoughts, I can stop them when they occur. Are all stereotypes dangerous? No, I don’t think so. Though the line to cross is very thin, if not imperceptible. Correct me if I’m wrong, but I believe the word ‘stereotype’ is not originally meant to have a negative connotation. It simply applies when a label (say ‘student’) carries with it a certain image, implies certain things – not all of which necessarily ‘good’ or ‘bad’. For example, a student is stereotyped as being carefree, somewhat messy, poor, etc. A lot of the times these stereotypes will be accurate, as they are – after all – formed by a large number of observations and passed on from person-to-person, generation-to-generation. But it would be futile to deny that stereotypes have come to be associated with an overly simplified (i.e. ‘bad’) view of certain groups of people, and that the word is generally used nowadays with the implication that stereotyping is bad. Here’s an example. If you ever hear me say that Americans are stereotyped as ignorant about the outside world, what I’m really saying is that this view of Americans is overly simplified and does not accurately reflect the diversity of the American population. I’d be, if you will, speaking between the lines. And no American should take offence if they hear me utter the above words, because the point I’d be trying to make would be that it is misleading to call Americans ignorant, and whoever stereotypes them so would be saying more about themselves than about Americans. Still, character stereotypes are nowhere near as dangerous as moral stereotypes: declaring something (usually a person) ‘good’ or ‘bad’ based on the label they’ve earned or been assigned. In Thailand, for example, doctors are generally stereotyped as good people. I’m not saying that all doctors are not good, but I am lost as to how moral authority can be derived from a training (however intellectually-demanding, gruelling, or time-consuming) in human anatomy. Such moral stereotyping has also become commonplace in the current political mess (for lack of a better word) in Thailand. Someone says something you disagree with? Of course they’d say that, they’re bad people. They’re evil. And it’s up to you, the good people, to defend Thailand from this horde of evil people doing evil things to the country. They say love blinds and power corrupts. Well, I’m starting to think morality is pretty good at both. I’m not sure when being on the moral high ground came to give you carte blanche to do anything, but that appears to be where we’ve come to. At first, it was amusing to observe. But now it’s just tiring and exasperating to see people trapped in their black and white perception of the world preaching morality at every turn. It really is. The world isn’t black and white. And everyone’s conception of morality – of what is good or bad – differs based on their personal experiences, teachings, preferences, etc. Which is why the world remains divided on issues like abortion and capital punishment. You cannot say people who don’t support abortion are bad no more than you can say people who do not support your political party are. Well, you can, but it’d be saying more about you than about the people you’re talking about. I do wish people would realise this. I do think it would make the world a nicer place to live in. I’m actually of half a mind to campaign for Philosophy to be taught in high schools, as a compulsory subject, so people would (I hope) come to realise from an early age that the world is not black and white, that there is no single ethical system that morally governs the world, that ‘good’ and ‘bad’ mean different things to different people – and that they should mean different things to different people. But I don’t really see that happening any time soon.